Workrite Fundamentals AKP02 - Jestik, Inc. minutes! The Fundamentals AKP02 is suitable to be utilized as a center or corner work station. 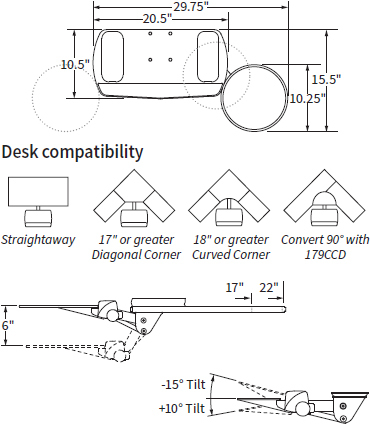 It is composed of a durable molded platform, a Pinnacle 2 Value keyboard arm, and a separate tilting mouse tray. The Fundamentals keyboard arm comes equipped with smooth performing 17” or 22” nylon glide track and a removable wrist cushion for added comfort. Attached to the arm is a mouse tray that can be moved to either side to accommodate left-handed and right-handed users.